At PROPERTYOLOGY we believe investing in property is about building wealth and making money, but it is also about minimising risks along the way. Ultimately, property should be treated as a financial instrument (similar to shares) and investing in property should be as emotionless as possible. This is completely different to the process one would go through when looking to purchase a new family home. When looking for our next family home we often ask questions like, do we like the suburb? Is it close to work or the kids school? Is it close to family? Is the layout and design what we want? These questions are all driven by emotions and whilst very important when choosing the family home, they do not assist in making the most astute investment decisions. Selecting an investment property should firstly be about the location. Given the size of Australia (approximately 550 Local Government Authorities spread across 8 states and territories) it is very unlikely that where we want to live personally, will also be the best investment opportunity. Even once a location is strategically selected given economic conditions and various industry outlooks, picking the exact property is then a lot more complex than simply searching online real estate portals. We still need to understand the general demographic of that location, review town planning and infrastructure projects, zoning and flood maps and decide based on all of this information, whether the most astute decision for this particular location involves investing in houses or apartments?? What constitutes an astute investment decision will be vary in each location based on the outcome of all of this research. It’s certainly not as simple as saying “houses are better than apartments” as this article explains in more detail – Demographics lead to Dwelling Styles. 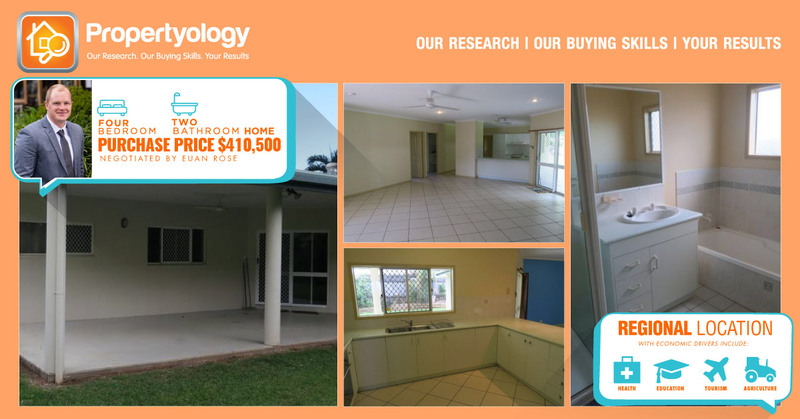 The above is just a tiny sample of the level of research Propertyology undertook and carefully considered prior to formally recommending this location and specific property to first time clients Kent and Anneka. Whilst this particular property might even be the style of property that Kent and Anneka would live in themselves (Anneka even said “I know I am not supposed to get emotionally attached to the house, but I love it!”), that isn’t the reason it was selected. This property meets Propertyology’s strict selection criteria in terms of zoning, flooding, social housing and proposed development activity just to name a few. It is situated in one of our ‘acceptable streets’, is the right style of property for the local demographic, appears to be low maintenance and in good condition. An independent rental appraisal indicates that this large 4 bedroom, 2 bathroom home 15 minutes from the CBD and other major employments nodes in this particular major regional centre will rent for up to $410 per week. The cherry on top is that our Buyer’s Agent Euan Rose was able to negotiate a final purchase price of only $410,500! Overall an exceptional result for our first time clients Kent and Anneka. Congratulations again! !